This article will show you how to apply a Client Deposit to an Open Sales Order/Invoice. If you have already posted the Invoice and you need to apply a Client Deposit, see this article. Note: This article assumes that there is already a Posted Client Deposit or A/R Credit. If there is not, please see the article on how to Enter a Client Deposit. 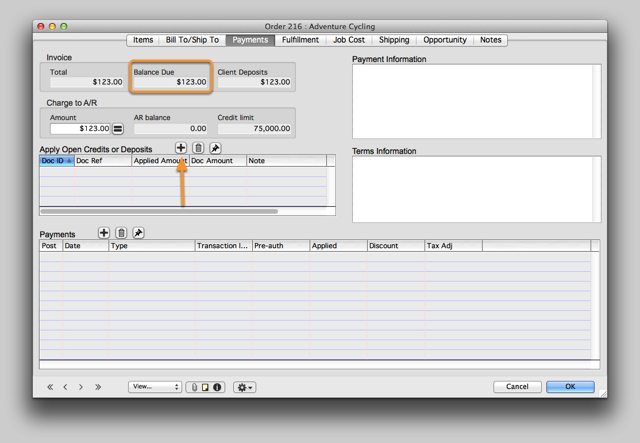 You can see there is a $123 Balance Due and currently we are charging that to the Client's A/R Sub Account. This is not what we want to do because the customer already prepaid us a $123 Client Deposit. Click the + symbol next to the Apply Open Credits or Deposits section. 2. Please select a Document. Select the Client Deposit that you want to apply. If there were other A/R Credits (such as those resulting from a Credit Memo) you would see those in this list also. 3. The Client Deposit has now been applied to this Order. Now you can see that the Balance Due = $0 and the $123 is listed under Applied Amount. 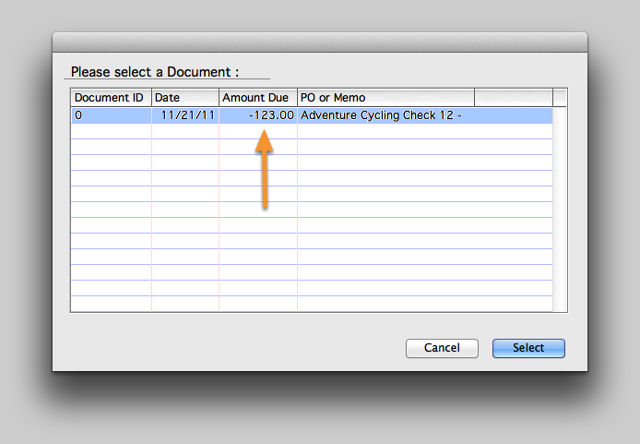 You still might need to clear out the Charge to A/R amount so the Invoice can be posted. When this Invoice is posted, instead of charging a Debit to the Client's A/R Sub-account, the Debit will be charged to the Client Deposits liability account. Zoom: The Client Deposit has now been applied to this Order.